Economic shifts are part of evolution. For some, the change is good. Others see it as bad. The key to gaining from economic shifts is to BE PREPARED. Here are two big questions in today’s rapidly changing world that can help us prepare for the current economic shifts that are taking place. #1: How do we keep our spending power ahead of inflation? This requires a lot of capital, huge returns from an investment or a job or business. #2: How in the rapid pace of modern society can we keep our earnings up and have a fulfilled life? Yesterday’s message, looked at how to earn an extra $19,690.10 a month though your own micro business. Yet using income as a starting point for your business is not enough. Change is too fast these days. Methods of earning in a micro business that works now may not work in the future. If your business just chases the cash, life can be too frustrating, wearying..dull…stale…stressed. When Merri and I realized this over a decade ago, we really began to focus on having a PIEC business…one where fulfillment and service to the client came first…then the cash. We have all heard of peak performance and peak experiences. PIEC is better because it means Personal Income Earning Corridor and “Turns your passion into profit”. (I know many people are writing this idea now but Merri and I first started sharing this thought over ten years ago in the 1990s. In short PIEC means incorporates making money…living within your means…saving…investing ahead of inflation…feeling great about what you do…and having fun in the process. When Merri and I arrived at this conclusion, we dramatically altered our lifestyle. We stopped living like the “social norm” and began living as we really desired. We sold our house in Old Naples, our Rolls Royce and moved to a run down Blue Ridge farm (where we lived in a tent for the first six months) and a remote hacienda in the Andes (where we lived in a shed worse than a tent for six months). We sold our million dollar a year direct mail publishing business and began a micro encore publishing business. Many of our friends and business associates thought we would fail at our goal which was to have the smallest, most profitable publishing company in the world that we thoroughly enjoyed. We did not fail. I think we now make more profit than when we had a big busy business. More important we gain much greater fulfillment from life and help others more. The best solution for survival and profit during change is a small, flexible, global business. Most businesses can beat inflation by raising the price of their product or service. The way to create such a business is to begin doing something that you have always really…I mean really wanted to do. I look forward to sharing peaks with you. Join us at our upcoming courses. We have a few spaces left for you to join us this August 15-17, to stay at our farm and learn at Susan Rotman’s business intuition course. 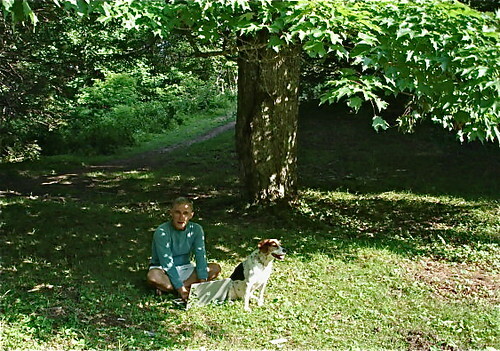 Here I am enjoying the cool Blue Ridge weather working beneath on of my favorite Maple trees.